The Chesapeake Bay is an ecosystem in peril. Pollutants from animal farms, urban and suburban development, sewage treatment plants, and coal-fired power plants are deposited into the Bay causing algae blooms that consume the dissolved oxygen and cause dead zones that cannot support aquatic life. To restore this environmental treasure and economic engine, all contributors to the Bay’s pollution problems must be held accountable. CPR works to ensure that state governments and the EPA are being vigilant, transparent, and equitable in holding polluters responsible for their share of the pollution. EPA's plan to restore the Chesapeake Bay requires states within the watershed to stick to strict cleanup deadlines over the next decade. In June 2014, EPA reported that many of the states were falling off schedule. Planned reductions in nitrogen fell short of reaching the TMDL’s 2017 target by nearly 6 million pounds. Pennsylvania’s failure to rein in pollution is particularly concerning since the state is the source of about half of the nitrogen that makes its way into the Bay. In 2018, the long-running effort reached a critical juncture. The Total Maximum Daily Load (TMDL) for the Bay established 2017 as the first of two key deadlines. By then, the state and federal partners were to have in place 60 percent of all projects, practices, and policies needed to reach final pollution reduction targets by 2025. Further, 2018 marks the end of the “midpoint assessment” period for the Bay TMDL, during which major policy decisions will be made to guide the Bay cleanup plan toward its completion in 2025. As it stands, the states are still lagging. CPR is keeping careful watch on this Midpoint Assessment period for the cleanup effort, and has created a one-stop clearinghouse on the subject. Industrial animal farms, known as concentrated animal feeding operations (CAFOs), have a significant impact on the health of the Chesapeake Bay. Unlike human waste, manure from CAFOs is usually spread onto land untreated. From there, it can flow into Bay tributaries—still untreated—and finally into the Chesapeake itself. As a result, the operations account for an outsized share of several types of pollution in the Bay, including significant percentages of nitrogen, phosphorous, and sediment. CAFOs are considered a point source under the Clean Water Act, thus operators must obtain a permit and are subject to government oversight. But Maryland, the state often considered to be the most advanced in its efforts to restore the Bay to health, is lagging behind in its efforts to reign in pollution from CAFOs. According to a November 2013 report by CPR President Rena Steinzor and Policy Analyst Anne Havemann, three years into the state's effort to enforce the new TMDL, the Maryland Department of the Environment (MDE) has built a considerable backlog of pollution permit applications from CAFOs. The permit is the only way to compel CAFOs to follow certain best practices to limit pollutants flowing into the Bay. MDE has not registered 26 percent of Maryland’s CAFOs and MAFOs. Specifically, MDE had not registered 26 percent of Maryland’s CAFOs and MAFOs. Read the Issue Alert, and check out an accompanying interactive map. After penning the Issue Alert, Steinzor and Havemann continued to strongly encourage MDE to stop waiving pollution permit application fees. They wrote a follow-up letter to the agency, an op-ed in the Baltimore Sun, "Why are polluters getting discounts?" published December 27, 2013, and they submitted comments to the agency when the general permit came up for renewal. In December 2014, the agency began collecting permit and application fees. In November 2013, a federal judge in West Virginia ruled that certain pollutants from CAFOs were exempt from the Clean Water Act’s permitting requirements, opening a gap in clean water protections. Read CPR Member Scholar William Andreen and Policy Analyst Anne Havemann’s summary of Alt v. EPA. The EPA decided not to appeal the decision. In June 2012, CPR's Rena Steinzor and Yee Huang examined the impact of factory farming operations on the Chesapeake Bay and concluded that a series of regulatory reforms were in order. Among the reforms proposed in Manure in the Bay: A Report on Industrial Agriculture in Maryland and Pennsylvania: Speedier review of pollution permits by state environmental agencies, rigorous inspections of polluting facilities, and fines for violations that are large enough to serve as a deterrent rather than a nuisance. In addition, the report calls for the states to treat large chicken and hog processing companies that have substantial control over a CAFO in the state—such as Tyson, Perdue, and Smithfield—as subject to Clean Water Act permitting requirements. As a result of spreading extreme quantities of manure on their fields, all but one industrial-scale chicken farm on Maryland’s Eastern Shore reported having at least one field saturated with “excessive” soil phosphorus, according to planning documents from 60 CAFOs in six counties. Excessive values tell farmers they should not apply additional phosphorus since crops are not able to absorb it and it ends up running off of fields, into streams, and eventually into the Chesapeake Bay where it contributes to dead zones that have plagued the Bay for decades. New, science-based regulations would limit phosphorus application on farms with excessive soil phosphorus readings. 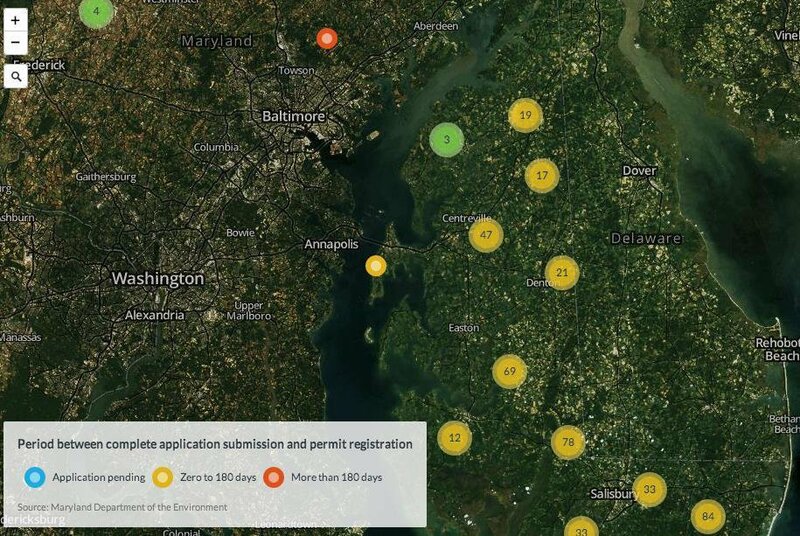 An interactive map, created by CPR Policy Analyst Anne Havemann and the Chesapeake Commons, shows soil phosphorus levels (known as Fertility Index Values (FIVs)) on fields on which farmers spread manure and illustrates why the phosphorus management tool (PMT) is so desperately needed. The large companies that dominate the poultry business rely on contract farmers to raise the chickens served at American dinner tables. The contracts Perdue, Tyson and others use with farmers are remarkably specific about how chickens are to be fed, raised, housed and more. But there’s one area in which they remain conspicuously silent: how farmers are to handle the millions of tons of waste the animals produce. Some of it can be safely used as fertilizer, but beyond a certain point, the nutrients from the waste reach levels that crops cannot use. So excess phosphorus and nitrogen seep into creeks and streams, thence to rivers and eventually into the Bay. The resulting elevated levels of nutrients give rise to huge blooms of algae that block out light for underwater vegetation. Eventually those blooms become "dead zones" in the Chesapeake, where fish, crabs, oysters, and other critters suffocate. Holding Big Chicken liable for the pollution their product creates is essential to solving the Bay's pollution problem, but the "integrators" -- so described because Big Chicken companies deploy a vertigal integration model to dominate the market -- have yet to reach into their deep pockets in a significant way. A March 2015 CPR Issue Alert outlines different types of legal tools that advocates might use to hold integrators liable for the waste generated by their contract farmers. The paper examines the advantages and drawbacks of each tool and urges citizen groups, state governments, and the EPA to continue to press for integrator liability through advocacy, litigation, legislation, and rulemaking. Read more about it.